John is a 45- year old athlete diagnosed with advanced bone cancer in his tibia. He underwent a bone transplant with allograft reconstruction. It has been one year since the procedure and the transplant has healed completely to the host bone. He has been given the green light to begin exercising by his doctor. 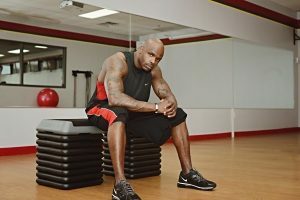 Because he underwent several cycles of chemotherapy he will have a greater risk for diabetes, damage to the heart and lungs, and osteoporosis (all of which can be prevented or minimized with proper exercise programming). Have John begin with five minutes of cardio. If it is weight bearing, you will need to slowly build up time and see what his body will allow without pain. You may combine something like riding a recumbent bike to get his heart rate up for five minutes (gradually adding more time and intensity as his body allows) with a minute or two of walking or elliptical training. Bridges with abduction will help to strengthen weak glutes that may be contributors to the anterior pelvic tilt and foot pronation. Supine leg lifts will help to strengthen the legs prior to adding a “load”. We must work on increasing the strength of the affected leg so that it becomes equal to that of the unaffected leg in order to maintain muscle balance and prevent injury. Dead bug will help to work on abdominal strength both for core stability and helping to minimize the anterior pelvic tilt. This will also help to increase/maintain full range of motion in the shoulders and hips. Knees-to-Chest will help to stretch the low back and can help to minimize the anterior pelvic tilt. Balance on two feet/discs with progression to one foot. 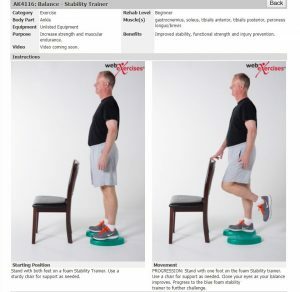 Begin with both feet on discs or balance device. If John has difficulty with stability begin with standing on one foot on the floor; working on maintaining his balance. Notice where instability is coming from if he is shaky on disc(s). Is it at the hip, ankle, or knee joint – or all of the above. What other exercises might compliment this one? John can continue with his upper body workout 2-3 times per week. Have him continue to add on to his cardio with every session, backing off if he has any pain. As he becomes stronger you can start to add light resistance with a few repetitions; gradually adding weight and repetitions. Once his lower body imbalances are corrected, you can create a more balanced lower body exercise program. Drive more traffic to your website with the personalized login page. 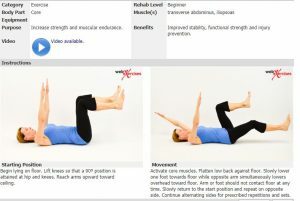 Patients and clients will login to their exercise program directly from your website. This will enhance your website and increase your visibility. Boost your online presence by adding the “Exercise of the Day” to enhance and distinguish your website. This displays educational information for your visitors inspiring them to learn more. Work smarter, not harder with template protocols. We know how busy you are, which is why we will help you build your own template protocols with exercises from our library or even exercises you’ve added. Bringing you the best content by continually updating our exercise library. You also have access to content from our partners including RockTape, TRX, BOSU, AIREX and more.